The new A350 bins are designed so that carry-ons can lie on their side in the overhead bins, squeezing in a few more bags. Looking at the pictures, it looks like it might be a tough squeeze. Does anyone know if this will accommodate the wide body bags (15, 16in) commonly allowed on European airlines? Or are we going to see a change in allowable dimensions? Finally, someone gets the bins right. I recall flying on other aircraft in the past when bins allowed this much more efficient storage method, but I can't remember which it was. I've always wondered why they weren't all designed to permit this wherever possible. sbm12/wandering aramean/seth also posted a pic on his blog, obviously of the exact same bin as shown above. 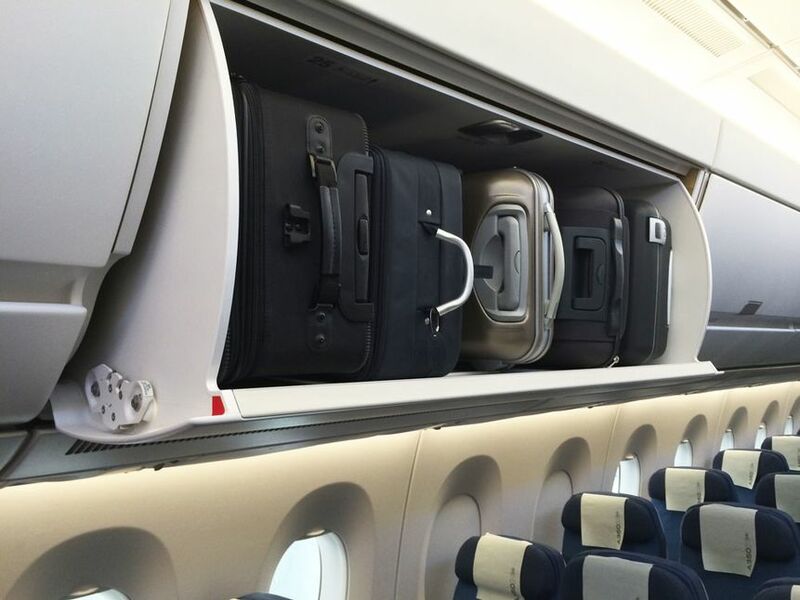 I think the outside bins on the lower deck of the 747 can accommodate bags sideways, also. I wonder about the weight capacity of those. 5 bags can get pretty heavy. Which would be Boeing, right?? They've had similar on their Sky Interior product for several years now. Right. Are you confusing me with someone who has ever dissed Boeing? Excellent! Now if only an airline would actually buy the Sky Interior product. Confirmed--our bags have gone sideways into a 747 several times. OT - there's a word you don't see often. Or ever. Looks like an Oz thing. No. I'm suggesting that the "finally" in your post implies this is the first time it has happened and that's far from reality.